Episode 015 of the Ideas Architect Podcast. Graeme Cowan is a former Management Executive who crashed and burned – in a big way. After suffering with depression for over 5 years he tried multiple attempts to take his own life. Ten years later and a long road to recovery he has successfully rebuilt his life. He has now written two books with a third international edition due out in January 2014. 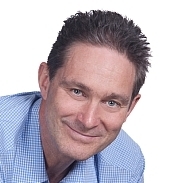 Graeme is a conference speaker and consultant who works with organisations to boost workplace productivity and build resilience. In particular, overcoming stress and depression. He’s also been a longtime supporter and advocate of RUOK, a not-for-profit organisation dedicated to encouraging conversations to prevent suicide. What is the Elephant in the Board Room? The biggest cause of lost workplace productivity. Why workplace stress may be costing you big dollars. How stressed leaders cause stressed workers. What dog whisperers and horse whisperers can teach you about leading your teams. Are you part of a Thriving Tribe? Four micro-strategies for building corporate resilience you can implement today to create a measurable difference. Why asking for help works. What RUOK stands for and why it matters. Why simple things make a big difference to mental health. Three everyday factors that undermine mental health and how you can avoid them. Why reflecting on your death today may be the best thing you ever do. The power of living your life in One Week Blocks to build resilience. The shocking secret that Gandhi, Martin Luther King had in common.